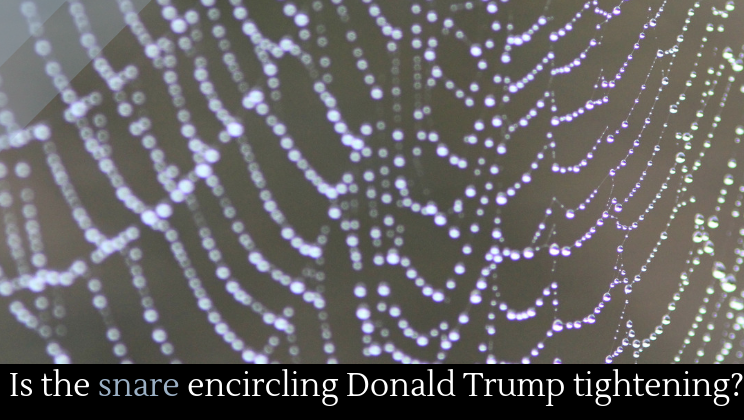 Is the snare encircling Donald Trump tightening? A Redditor posted the gif below, saying (accurately) that this is what the Mueller investigation feels like. This is so painfully accurate, especially to those who hope that the investigation will reveal some major massive corruption or conspiracy. One has to wonder whether this is how Americans felt during Nixon’s presidency, or if the twenty-four-hour news cycle and social media make the sense of an impending political catastrophe feel more impending than it is. That being said, the slow and steady march of Mueller’s investigation continues to suggest that members of the Trump administration, and perhaps even Trump himself, have been involved in questionable practices (to say the least). Monday ended with another bombshell announcement. Prosecutors ordered President Trump’s inaugural committee to turn over documents about its donors, finances and activities. House Intelligence Committee’s Democratic leadership will vote on whether to send Donald Trump Jr.’s closed testimony before that body to Mueller. This is significant because some Democrats have hinted that Don Junior was untruthful in his testimony. If that turns out to be the case, Don Junior––like others who have been untruthful before Congress––could face criminal charges. This would, in turn, give Mueller a potentially explosive source of information from deep within the Trump camp––a source that Mueller has leverage on. It is also possible that the Committee will turn over the testimony of other Trump insiders, including Jared Kushner and Steve Bannon. Democrats are also suspicious of some of Donald Trump’s real estate holdings. Maryland prosecutors have subpoenaed the company that owns President Donald Trump’s Scotland golf courses for its financial filings. Some Democrats believe that the funding for these golf courses may have come from Russian sources. If this turns out to be the case, it would lend further credence to the connection between Trump and the Russians. A recent Buzzfeed article revealed that a Russian-born lobbyist received half a million dollars of suspicious payments just before the controversial June 2016 Trump Tower meeting. This meeting has become a focal point for the possibility of potential Russia-Trump collusion to influence the 2016 election. One of Trump’s former campaign aides, Sam Nunberg, believes that the Mueller team has a “strong case of conspiracy” against Trump. Aside from the various speculations––which will never be fully resolved until the Mueller investigation is finished, if Trump even makes it public––there is one law that Trump has definitively broken, but you probably missed it. According to the law, “On or after the first Monday in January but not later than the first Monday in February of each year, the president shall submit a budget of the United States government for the following fiscal year.” But if you are hoping that this violation will lead to impeachment, don’t get too excited. This deadline has been missed several times throughout history, and besides, there are no penalties for missing it anyway. Overall, it seems that there is one clear narrative emerging from the Mueller investigation: Trump was probably involved in something sketchy with the Russians. The continued avenues of inquiry from the Mueller investigation hint at that, and the events covered in this article support it.